After languishing for nearly six months, a closely watched measure of global demand has recently showed renewed signs of life. The Baltic Dry Index, which tracks international maritime shipping rates for everything from iron ore to coal to grain, popped 15% over the last two weeks of April alone. Since few things are as finely tuned to the macroeconomic picture as Panamax Gearless Bulk Carriers, plying the seas loaded with the rawest of raw materials, rising shipping rates tend to bode well for future global growth. Against that improving backdrop is the more immediate threat of the gargantuan oil spill in the Gulf of Mexico, which could lead to higher shipping rates if it spreads, as freighters would have to steam around the slick in order to avoid fouling their hulls. Take the two together and the BDI looks capable of building on recent strength. 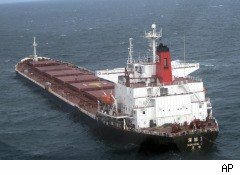 Pretty much the only way for retail investors to play the BDI is through dry bulk shipping stocks, such as DryShips (DRYS), Diana Shipping (DSX) or Navios Maritime Holdings (NM) -- but be forewarned that these shares are not for the easily seasick. Shipping is a cyclical, seasonal business where supply reacts slowly to demand. After all, it takes years to build a big boat. So if you're looking for some action, the dry bulk carriers promise a wild ride. DryShips, for example, is the giant of the bunch by market capitalization, and even that comes to just $1.6 billion. It's also extremely volatile, even by small-cap standards. With a beta of 3.7, it's nearly four times as volatile as the S&P 500 ($INX) -- and has the roiling stock chart to prove it. Shares in DryShips have been pressured by dilution as the company's been tapping the equity markets to raise capital, but that hasn't kept the majority of analysts from jumping on board. The stock gets an average rating of buy, according to Thomson Reuters. Shares currently trade at less than five-times forward earnings, offering a discount of about 10% to their own five-year average. Meanwhile, analysts' average price target stands at $7.90, making the implied upside nearly 40% in the next 12 months or so. At $1.2 billion, Diana Shipping is the second-largest stock by capitalization in the subsector, but with a beta of 1.7, it's far less volatile than DryShips. (Indeed, by market cap and volatility, Diana isn't much different from Children's Place Retail Stores (PLCE).) Analysts' average recommendation stands at buy, according to Thomson Reuters, while their mean price target of $17.95 gives the stock an implied upside of nearly 20% in the next year or so. As for the valuation, Diana currently trades essentially in-line with its own five-year average. Like DryShips, Navios Maritime Holdings is a fast-money stock. The company's market cap barely reaches $700 million while the shares bounce around with more than three-times the volatility of the broader market. Analysts' average recommendation stands at buy, while their $8.18 mean price target give an implied upside of more than 17% in the next 12 months. Shares offer a 15% discount to their own five-year average, according to Thomson Reuters, even after jumping by about 20% in the last month.